I'm baffled by the results of this survey on personal-care spending, ranked by city. By "personal care," the study included dollars spent on fitness, cosmetics, toiletries, salon/spa visits, and the like. The study was aiming to see if there was a correlation between dollars spent on personal care and levels of fitness among its residents. For the top and bottom cities, that was true: Austin spends the most money per person per month on personal care ($143) and is one of the fittest cities in the U.S.; Detroit spends the least ($18) and is also one of the unhealthiest cities. But then, as pointed out by The Hairpin, Portland, OR (always Portland, throwing a kink in the system! viva la revolucion! ), is one of the healthiest cities in the U.S. but spends about the national average on personal care items. Really, they couldn't have come up with colors other than red and blue for this? 1) The study's very premise is that spending on cosmetics and fitness are in the same category. And sure, they both fall under "personal care," but there are about a zillion reasons people work out (mental health benefits, lower cholesterol, stress relief, medically directed weight loss, rehabilitation--plus, sure, "those last five pounds" and the glow that working out gives you) and not that many as to why people wear cosmetics (my dissection of lipstick subtleties aside, but of course). I've always been sort of irked by the connection of beauty and health departments in women's magazines, even though the skin, after all, is an organ. And in this survey, in which both men and women responded, it skews the results: A man or woman buying, say, rock-climbing equipment isn't in the same headspace that a woman buying eyeshadow is. 2) No secret that self-esteem and happiness are complementary, right? Looking at the personal-care spending in the light of the happiest and unhappiest cities in America reveals that the people who are spending more money on personal care are also happier. Not all of the cities in the happiest/unhappiest cities rankings are listed in the personal-care spending chart, but of the top 10 cities that are: The happiest cities spent an average of $86.50 on personal care; the unhappiest, $68.70. And this is where I really wish that there were a demarcation between cosmetics/spas/salons and fitness, because of the antidepressant effect of regular exercise. But I wonder if happier people are also spending more on self-care that might relate to their happiness in less scientific, more aesthetic ways? 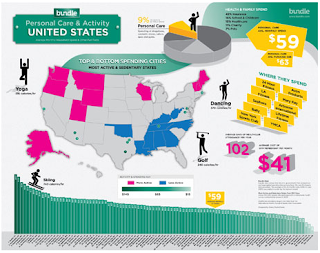 3) Four of the top 12 cities for personal-care expenditures are in Texas. Texas women also earn 81.4 cents on the (man's) dollar. I can't find all the data to bear this out, but I wonder if there's an inverse proportional spending on personal care to women's earning power--that in places where women earn considerably less, they need to increase their "net worth" by investing more in their looks. It's possible, but in looking at the cities where young, childless women outearn men, the average spent on personal care is actually slightly higher than the national average ($68.50 for these cities as compared to a national average of $60 on personal care). Thanks to Beauty Schooled for the initial tipoff! Such good analysis! Especially about the weird overlap between "health" and "beauty." It isn't just women's magazines (though boy do they/we ever do that!) -- that's at the crux of our whole complex relationship with beauty, because half the time we can't even tell if we're losing weight (or getting a facial, or insert-beauty-work-here) because it will be good for our health or because we just want to look better. Both fine/worthy goals, but one is definitely more essential than the other, in my book. Thanks! And yes, that's exactly it--it's really hard to sort of tap into ourselves and find out what our motivation is when we do things like lose weight, get a facial, a brow waxing. How much is about simple grooming? health? vanity? professionalism? relaxation? And what value judgments do we assign to those things? June of this year, Obama has vowed in the White House announced that he wants an administrative order of the way, unilaterally imposed immigration reform, the time 'about the summer.' At that Nike Site Officiel Nike Air Max 95 Femme time, the media suggested that Obama only nine weeks left to their own time, whether Burberry Top Handles the deadline or the wisdom of the decision itself, are very skeptical. For a president, it preaches is essential. While Obama has no fear of the election, but to respect the president of the United States, on the crucial issue of immigration reform promises, Obama is really distraught polls has hit a new low, I believe that immigration issues would make his position worse ratings . Obama's decision was interpreted as a move out of political considerations, the aim of the mid-term elections, not to offend conservatives, thus Nike Air Max 2012 Homme stabilize the Democratic camp. But the result is not curry favor, immigration reformers and Democrats in the activists, Obama expressed disappointment. Ironically, while Republicans took the opportunity to hit Obama into why this dilemma today, on both sides by the enemy embarrassing Burberry Sling Bags situation? Republicans forced too much, or he did not? It can be said Burberry Burberry Shoes Coats there are two factors, but itself to blame Obama. If we say that Obama's first political legacy Designer Burberry Outlet is health care reform, then the second term he most wanted to do is to make immigration reform. With two major Nike Free Run 4.0 Homme events, he can transcend many presidential and go down in history, however, it could have been a double-edged sword immigration reform, the pros and cons in sight. Because the population involved is too great, the interests involved are too broad. Handled well, can give the US economy a fresh injection of labor and purchasing power. But handled properly, can have serious social problems are just some of the key issues on immigration reform, Obama mishandled. Obama to bypass Congress to administrative measures to push hard for immigration reform, which further exacerbated the contradictions between the two parties and the government would conflict; again, administrative measures have been implemented have had serious side effects So the question of Obama's immigration reform, mainly unknown direction, ineptitude. We have repeatedly suggested that immigration reform first, in order to enhance the competitiveness of the United States to encourage people to the United States; second is to safeguard the legitimate rights and interests of legal immigrants. In the above two aspects, Obama just does not do well, mainly due to the overriding political considerations, Nike Air Max 2011 Femme in order to get more votes, but to focus on elsewhere. Thus, if immigration reform is not on the right track, Obama will hardly out of the woods.